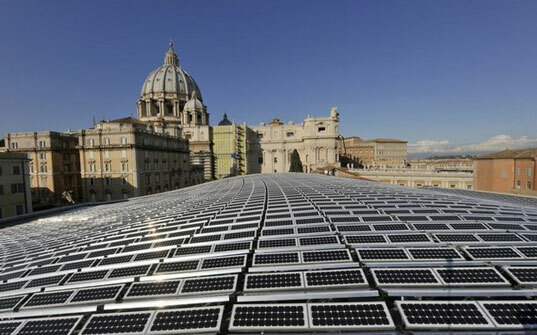 The Vatican is going solar in a big way. The smallest country in the world recently announced that it intends to spend 660 million dollars to create what will effectively be Europe’s largest solar power plant. This massive 100 megawatt photovoltaic installation will provide enough energy to make the Vatican the first solar powered nation state in the world! The Vatican is not exactly a large state, so its proposed solar plant will generate enough energy to power all of its 40,000 households. The installation will be located on a 740 acre site near Santa Maria di Galeria – the same place where the Vatican Radio’s transmission tower is located. The energy that it produces will be way above the needs of the entire Vatican, providing enough power to meet the needs of Vatican radio nine times over. 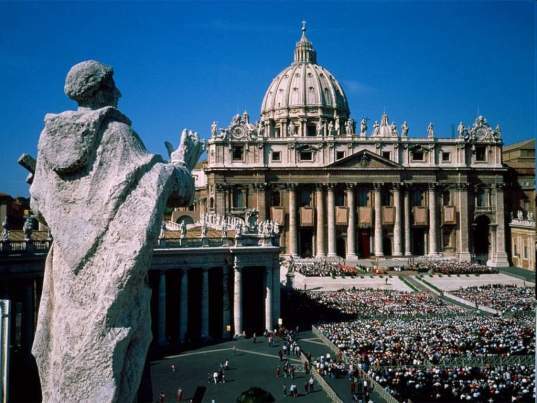 These aren’t the only moves that the Vatican is taking to reduce its greenhouse emissions. It is contemplating using an electric popemobile, the Vatican cafeteria will soon be decked with a solar heating system to provide heating and cooling, and even the Pope’s summer residence is being fitted out to get power from the methane generated by the horse stables. When looking for inspiration, the Pope clearly defers towards the heavens, but when looking for electricity, the sun is his choice. Why do this great article jogs my memory of some other identical the one that I read some other place? That's pretty incredible if you ask me. Despite the fact that it is the smallest country in the world, it does have a lot of financial backing. Next up, Monaco. So, I guess you could say the Vatican has finally come to understand the importance of God's SUN...the giver of life. Kudos, and only it only took a couple thousand years! http://scoopea.com/Environment/Inhabitat_Vatican_to_Build_Europes_Largest_Solar_Power_Plant Surely this story is inaccurate. If there's one thing I've learned on Digg, it's that religion and science are opposed in every sense, and they may never intersect whatsoever. And there's no way that diggers would lie or be biased about that sort of thing - no siree. wow. never though that i would agree with something the pope says/does. i'm pleasantly flabbergasted. Desert Tripper's comments displays his ignorance about Catholicism and the Vatican; the Catholic church owns and runs universities, hospitals, and research facilities (such as the Vatican Advanced Technology Telescope) in New Mexico. The problem Rome had with Galileo was NOT his heliocentric model (which was actually Copernicus'), but rather, his interpretation of Scripture as it related to his model. It's odd the anti-Catholics biggots can't find more recent incidents to demonstrate their arguments. Lastly, what in the world does the solar panel project have to do with your comment that "It is a very good thing that the Vatican no longer holds the global power that it once did"? It sounds like you have an axe to grind rather than a relevant comment to make. Wow, you have to admit that is really cool! It's interesting to see the Vatican actually embracing modern technology, especially since that very same power-center basically stalemated much technological advance for many centuries. Galileo was the most prominent poster child for this misuse of power. It is a very good thing that the Vatican no longer holds the global power that it once did. The Vatican is going solar in a big way. The smallest country in the world recently announced that it intends to spend 660 million dollars to create what will effectively be Europe's largest solar power plant. This massive 100 megawatt photovoltaic installation will provide enough energy to make the Vatican the first solar powered nation state in the world!